What's the Dorian pentatonic scale? The Dorian pentatonic scale is a minor scale built with five notes. There are four main types of Dorian pentatonic scales, the most known is also named "Kumoï scale", a Japanese scale. It has this interval pattern : 1 (root), 2 (second), b3 (minor third), 5 (perfect fifth) and 6 (natural sixth). You can consider it as a part of the Dorian mode, the second mode of the major scale. Indeed, the Dorian mode is spelled 1 - 2 - b3 - 4 - 5 - 6 - b7. If you leave out the fourth (4) and the minor seventh (b7) you get 5 notes making the Dorian pentatonic scale. How is Built The Dorian Pentatonic Scale? Here is a comparison with the Dorian mode. You can see that the Dorian pentatonic scale has no fourth (4) and no minor seventh (b7). What's The Difference with the Kumoï Scale? The Dorian pentatonic and the Kumoï scales are simply the same. The name is different according to the country and the style of music. How To Use The Dorian Pentatonic Scale? 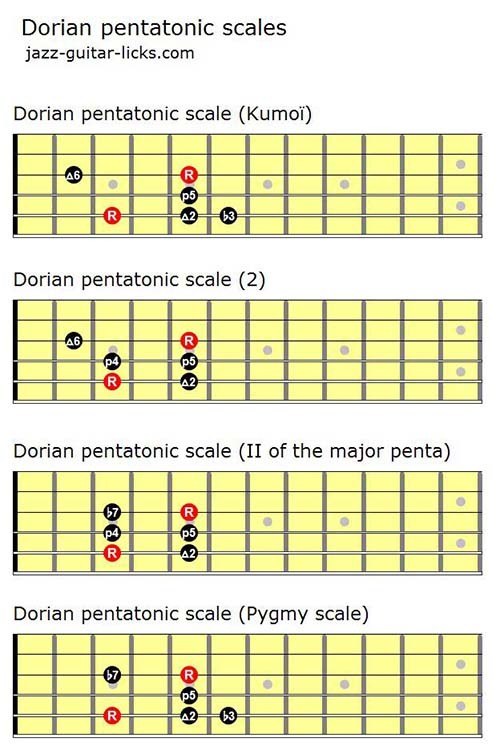 The Dorian pentatonic scale is designed to be played over minor chords as m7, m11 but mostly over m9 and m11 chords. Indeed, the Dorian pentatonic scale highlights the ninth (9) and the thirteenth (13). It seems there are many confusions about the construction of the Dorian pentatonic scale. Some books and teachers give three other formulas : 1 - 2 - 4 - 5 - 6 or 1 - 2 - 4 - 5 - b7 or 1 - 2 - b3 - 5 - b7. The pentatonic scale formula starting on the degree II of the major pentatonic scale would be 1 - 2 - 4 - 5 - b7. The 1 - 2 - b3 - 5 - b7 version is also known as Pygmy scale, an African scale from Rwanda. In any event, they all derive from the Dorian mode and works well over minor chords, it is up to you to choose the one you prefer, depending on the harmonic context. Here are four guitar neck diagrams to make the difference between the four Dorian modes. This simple lick below shows how the Dorian pentatonic scale can be applied to the ii chord of a basic II-V-I progression. You can notice that this II-V-I jazz line is built only with pentatonic scales. 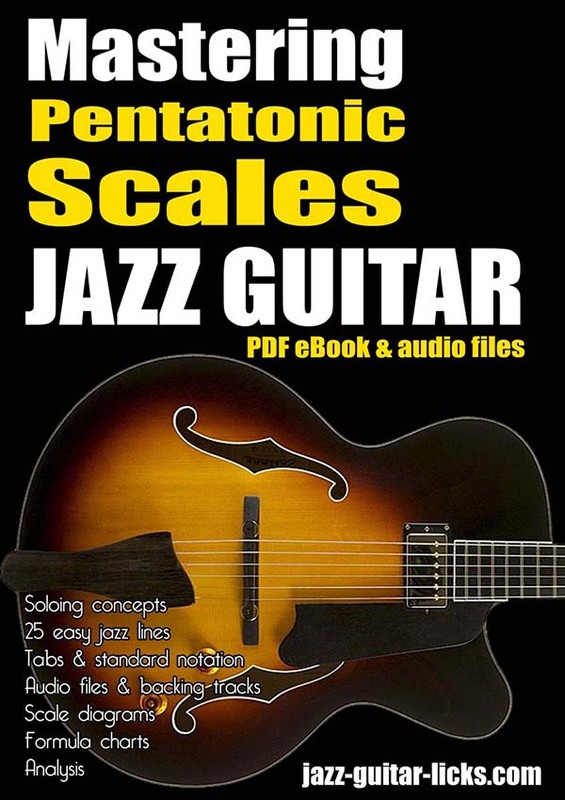 This is the purpose of this PDF eBook named "Mastering the pentatonic scale", check it out.